It's a easy phrase, nobody perfect, but far from our reach. 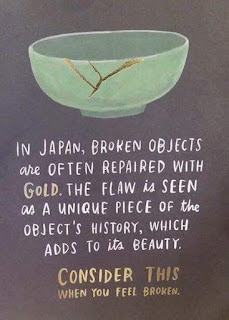 Imperfections are gifts in our life. Having imperfections are the signs that we're a gifted and blessed beings. The question is, can we really see it? 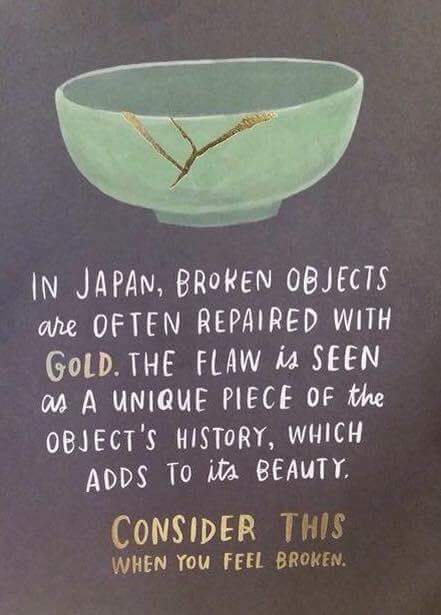 The beauty within our imperfections, so we may stop wasting our time in sadness, mournfulness, or even depression? It might become a very long journey, it might become an instant enlightenment, but it doesn't matter, as long as we are cured from our ignorance. Accept ourselves, both the good and the bad, the black and the white, the high and the low, the day and the night, all those brightest and darkness moments of our life, our dreams, and our nightmares. Who say people can't enjoy the sweet milk or the bitter coffee as a same existence; or those who can cry in broken heart for his biggest success and laughing happily at his worst failure. This life is a dance, dance that not perform a single color, dance which not happens in a single season, dance whose dancer move freely. It doesn't matter whether the dance is a form of beauty or not, since beauty is relative. But it is matter whether you realize you are dancing fully or not, whether you dance in joy or not, whether you fall in love with your dance or not. When you dance fully, fill it with joy, and love it with all your heart, tell me whether imperfections then become matter?